A person shelters under a blanket near the state Capitol on March 23. A person shelters under a blanket along East Colfax Avenue near the Colorado State Capitol on Thursday, March 23, 2019, a practice that falls under the city's current ban on such shelters in public places. The Associated Press An unidentified woman clears trash from a makeshift homeless camp near the Denver Rescue Mission on March 7, 2016, ahead of a city eviction of people living on the street in the area. the associated press “We don’t want to become the next Los Angeles, which probably has a multi-million dollar cleanup,” Denver Mayor Michael Hancock said. Stroll any street in downtown Denver, and you’re likely to come face to face in vivid and sometimes tragic detail with the city’s grinding and intractable homelessness problem. A woman sleeps beneath a teal blanket on a cold spring day in Civic Center. Later she rises and heads to the bus station, blanket trailing behind. On the 16th Street shuttle bus, she croaks a hacking cough. Against this sad urban backdrop, Denver voters are to decide May 7 whether to repeal the city’s ban on homeless camping. Opponents warn that the measure could turn Denver’s parks, sidewalks and other public spaces into permanent encampments for squatters, spreading trash and endangering the public health and safety. That debate has exploded into an expensive battle, with 300’s main opposition group out-raising supporters by better than 10-to-1 at last count. Together Denver, which urges a “no” vote on the referendum, has raised $558,784, compared with $53,946 gathered by the pro-300 campaign, finance reports as of mid-March show. Several prominent business groups have contributed to Together Denver. The Downtown Denver Partnership, a group of about 700 businesses, donated $100,000. 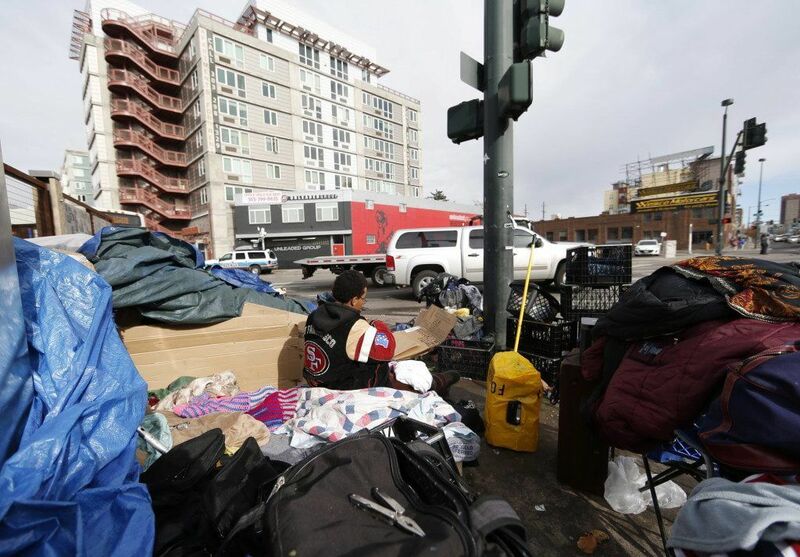 Under Article IX, authorities could not “enforce any ordinance ... that limits, prohibits or penalizes the rights secured by this ordinance,” including the city’s camping ban on public property. How the measure would play out on the streets of Denver is fiercely debated. They say 300 would not allow people to litter, block roads or commit crimes. But anti-300 Together Denver warns in a position paper that the measure could lead to “large encampments” in city parks and around stadiums, the Denver Zoo, museums and other public sites. They also say cars and RVs could be parked outside homes, and people could camp on residential sidewalks . For example, the memo warns, “park curfews ... would no longer be enforceable. Nor would ordinances that prohibit overnight camping or setting up of tents and structures in parks.” Backers of 300 dispute that conclusion. 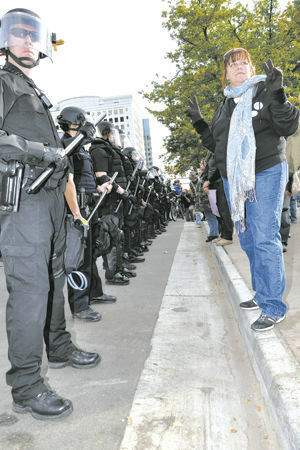 The measure has its roots in the city’s response to the Occupy Denver movement several years ago. Like many U.S. cities, Denver was dealing in 2011 with an encampment set up in Civic Center by people protesting economic inequality . The following year, the City Council passed an ordinance outlawing unauthorized camping on public property. It allows police to cite or arrest an illegal camper, but only after asking the person to move on, then issuing a written warning. In practice, police seldom cite anyone under that ban, let alone make an arrest. Instead, campers often move from place to place. Initiative 300 seeks to overturn the camping ban and the separate “sit lie” law, which bars people from sitting or lying within the boundaries of the Downtown Denver Business Improvement District between 7 a.m. and 9 p.m. In 2012, people living on the streets were hardly new in Denver. During the 1980s, homeless people would camp out along the South Platte River, under bridges, on steam grates and along the south side of the City and County Building. Police would disperse them, and advocates would try to talk them into shelters on cold nights, but the problem persisted. Denver got a head start on its shelter system thanks to one dramatic event 36 years ago. During a bitterly cold winter in 1983, the Rev. C.B. Woolrich — better known as “Father Woody” — opened the Holy Ghost Church to the homeless. “Listen, Jesus Christ told us to take care of the least of our brothers and sisters. That means even if you have to hold your breath,” he told his congregation. “And we’re going to do that here at Holy Ghost Church. If you don’t like it, find another church. Three years later, the Archdiocese of Denver opened Samaritan House, the city’s first shelter of its kind and the start of the shelter movement in Denver. 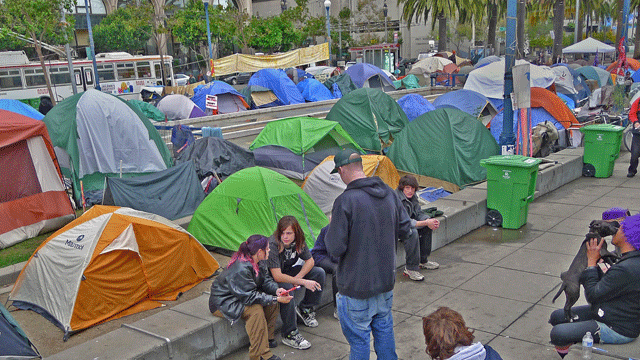 That head start proved significant, because other cities without enough shelter space, such as Los Angeles, San Francisco and Seattle, have seen courts nullify their urban camping bans. Those rulings were based on a lack of adequate shelter space for the homeless. Opponents of Initiative 300 say Denver has enough space for the 3,445 homeless identified in the 2018 Point in Time survey, a 24-hour head count of the city’s homeless residents. They cite a February report by the REMI Partnership — a policy organization that includes business groups such as the Colorado Association of Realtors, the Colorado Bankers Association and Colorado Concern — that calculates the city has 1.2 shelter beds per homeless person. Advocates of 300 dispute that figure, saying shelters often aren’t viable for families that don’t want to be separated and for people with pets or disabilities. They say shelter space is inadequate to house all of Denver’s homeless. As the city’s economy, population and housing values have soared, affordable housing has grown scarcer while the ranks of the homeless have increased. But after four years of seeing those bills die in committee, they decided to take a different approach. “After it being killed (in the Legislature) year after year, we said, ‘Let’s take it to the people,’” said Howard, the pro-300 spokeswoman. Organizers gathered nearly 10,000 signatures, and the issue went onto the ballot. Howard said the police policy of shuffling the homeless along through the camping ban does not work. “We call it homeless whack-a-mole,” she said, referring to the carnival game in which people hit the mole puppet only to see it pop up elsewhere. Opponents of Initiative 300 respond that it is cruel and unusual to have people live on the streets. “We recognize something needs to be done, and the homeless community needs better access to affordable housing,” said Alvina Vasquez, a spokeswoman for Together Denver, the main group fighting 300. The partnership wants to be part of the long-term solution, said Kate Barton, vice president for special projects. “Ultimately we know we need good solutions, and we’re at the table to work on those solutions. But we do not believe Initiative 300 gets to the root of the issue or does anything to help solve the problem,” she said. Mayor Hancock said having people living on the streets is not the solution. “If I was homeless, I find no compassion in your answer telling me to go sleep in the park or go sleep on that concrete. Nothing’s healthy about it. Nothing’s safe about it,” he said. Where the camping occurs now, police have handled felony assaults, Hancock said. Last summer, three people were killed trying to sleep outside, he said. Howard, the pro-300 advocate, acknowledged that the “right to survive” initiative is just that — a right, not a solution. But the city’s attempt to create affordable housing in recent years has fallen way short of the need, Howard said. At community forums, the two sides have sparred over what the wording of the measure would mean. Advocates claim it would not result in doing away with park curfews — disputing the city’s view — and would not allow the homeless to obstruct public sidewalks. But opponents say the initiative is so vague and poorly defined that the result would open the gates for an incursion of the homeless in parks and other public spaces. They also worry that a provision that bans “harassment” of the homeless would make it difficult for police and outreach workers from helping homeless people who are at risk. In any event, city officials believe that the initiative could create legal conflicts as its provisions are untangled. Meanwhile, organizations that serve homeless people have watched both sides of the debate warily. Alderman does not believe asserting the right of the homeless to live on the streets is going to help their lot. But she also looks at the more than $500,000 raised by opponents of the initiative — and thinks how that money could have enabled her to hire six more outreach workers to get and keep homeless people off the streets. “At the end of the day, we believe getting more resources into the system is the best way to make sure that people have alternative and safe places to go,” Alderman said.